Improving this shoulder would be in keeping with honoring the father of Oregon’s bike lane program. As far as bikeways go, the one honoring the father of the Oregon Bike Bill isn’t much. It’s nothing more than the narrow and occasionally bumpy shoulders of the Jacksonville-Medford road. 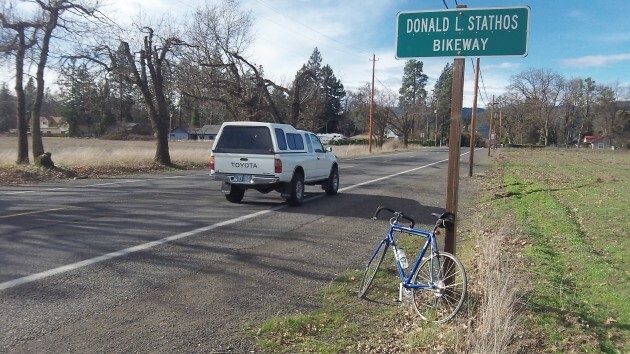 This is supposed to be the Donald L. Stathos Bikeway, named for the Republican representative from Jacksonville whose 1971 bill launched Oregon’s nation-leading bikeway program. Stathos served in two sessions of the Oregon House, in 1969 and ’71. He died in 2005 at the age of 81. The road where he had often ridden his bike between his Jacksonville home and Medford insurance office was dedicated in his name in 1979. This is said to be the first designated bikeway in the country. For that, Jackson County might want to spiff it up a bit. Next time the road is surfaced, it could stand to be widened foot or so and have a proper bike lane installed on the segment that doesn’t have one. I’m on the Stathos bikeway only once or twice a month, if that. Lots of riders use it far more often, for daily commuting as well as weekend day trips. For them — and for motorists who would get a safer distance from cycling traffic — a full bike lane would be a great safety improvement to have. Hasso–I’m glad you like to ride your bike but lately you seem to be a “johnny-one-note”. I think your picture shows a lot of what we have to deal with. No traffic in sight and the pickup is over the painted line. Once it is called a bikeway, it should be safe for all biker riders, including elderly and young. I feel it is a way to get funds from the State. If a sweeper or tractor with a rotary brush gets gravel off the highway applied to allow travel over ice can’t get the bike way too it should make another pass. Most bikeways are not safe for bike tires, young riders, or elderly riders. Bridges need signs slowing traffic over bridges. Grand Prairie over I#5 is terrible. Motorist almost hit oncoming traffic as they pass bikes. Let the highway and street department hierarchy get their own children or grandchildren on these so-called Bikeways. And if any place should have a great example of a good Bikeway it would be this one honoring the local politician that got Bikeways started. Jackson County has turned this in to a farce.